Students in Grades 5-9 at East Lake School had the chance to flex their science muscles at the third annual science fair Jan. 30-31. “It’s very interesting the variety of projects,” said Grade 7-9 Math and Science Teacher and Science Fair Coordinator Matt Buckley. The science fair gives the students the opportunity to showcase their scientific knowledge on a topic of their choice. “Very little guidance comes from the teacher in terms of topic choice. “We mostly just guide them through the scientific process and help them get from point A to point B in their project, so it gets completed,” said Buckley. Topics this year ranged from what laundry detergent works the best to how meditation affects a person’s mood. “It’s actually impressive the different ideas that these kids come up with,” said Buckley. “At the grade 7 to 9 level we had a student who is looking into abandoned oil wells in Alberta,” he said. Buckley said that the student came up with some good ideas to get something out of the abandoned oil wells. As both a science teacher and the fair coordinator, Buckley said that it’s pretty neat to watch students work on topics with real world implications. “Anything that’s environmentally conscious in terms of a topic or…we have a lot of projects that explore consumerism,” said Buckley. Several projects compared household products to find out which worked best. “It’s cool when they apply to their own life or the life of their family or even the rest of the students in the school,” said Buckley. In addition to developing students critical thinking and science skills, the fair also builds confidence and public speaking skills. “It’s a good opportunity for them to kind of get out of their shell, show what they care about and talk about something they’re passionate about,” he said. The younger grades that aren’t participating in the fair get to come through and see the projects as well each project is judged by two different judges. “It’s a long day for the students,” said Buckley. “I know the students do enjoy presenting” he said. 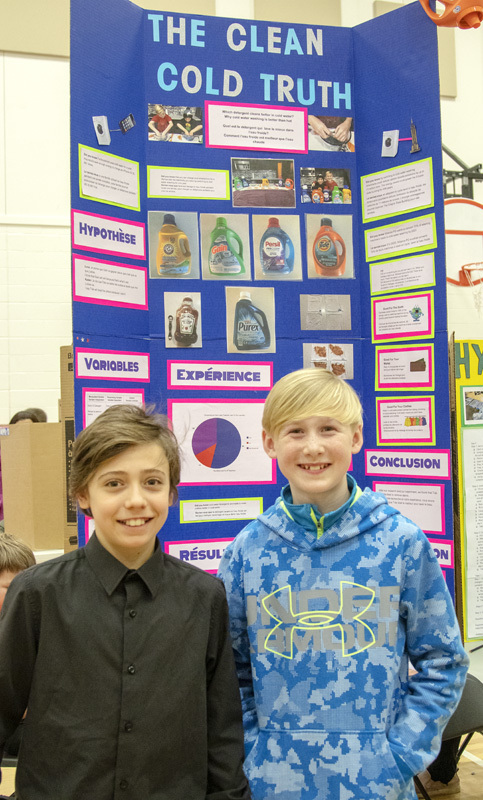 Visit the www.theanchor.ca to see a video from the science fair.